Two of Bollywood’s biggest stars, Katrina Kaif and Salman Khan, commenced filming in the University of Dublin, Trinity College (www.tcd.ie) this month (September) for the first Bollywood blockbuster to be made in Ireland. Filming of Ek Tha Tiger, a spy-thriller featuring the usual Bollywood elements of music and dance, has been taking place in the University and around Dublin city centre and will conclude on October 15th next. The film’s storyline involves a world renowned scientist working at the University of Dublin, Trinity College, who is suspected of selling missile technology secrets to Pakistan. The Indian Government sends an Indian secret agent to find out about the Professor’s activities. The agent, codenamed Tiger, falls in love with the Professor’s caretaker Zoya, who is studying at a fictional dance academy located at the University and together they embark on a rollercoaster journey that takes them from Dublin to Istanbul, Kazakhstan and Chile. Numerous locations on the University of Dublin, Trinity College’s historic and picturesque campus will be used as a backdrop during the filming, which includes a large open-air dance sequence in Parliament Square. Produced by one of India’s most prominent film companies, Yash Raj Films, Ek Tha Tiger will be directed by award-winning Indian director Kabir Kahn. The film is set to bring about €1.5m to the Irish economy and create over 1,000 short term jobs. The film will be co-produced by Oscar-winning Irish company Fantastic Film and is expected to be released in June 2012. The University of Dublin, Trinity College was established in 1592, and is recognised globally as Ireland’s premier university. It is currently ranked 65th in the top 100 world universities by the QS World University Rankings 2011. In the Times Higher Education World University Rankings for 2010, TCD is ranked 76th in the top world universities and 15th in the top European universities. The University has 16,800 students, of which 5,330 are postgraduate Masters and Doctorate students. Some 16% of students are from outside of Ireland. The university employs some 820 academic teaching staff, of which 43% are international. Many of its alumni have helped shape history and include two Nobel prize winners – Ernest Walton for physics and Samuel Beckett for literature. The President of Ireland Mary McAleese is a former Law professor in the University. As Ireland’s premier university, the pursuit of excellence through research and scholarship is at the heart of a Trinity education at the University of Dublin, Trinity College. It has an outstanding record of publications in high-impact journals and leading academic publishers, and a track record in winning research funding which is among the best in the country. Interdisciplinarity forms a key element in the university strategy in increasing Trinity’s international standing as a research-led university. It has developed significant international strength in its research in eight major themes which include globalisation; digital arts and humanities; telecommunications; nanoscience; neuroscience; ageing and independent living; immunology and molecular medicine/ cancer. There are currently over 100 students from India studying at the University of Dublin, Trinity College. Students are studying at the undergraduate as well as at the postgraduate level in taught and research programmes. The popular areas of study include business, engineering, computer science, and health sciences. There is also a growing interest in studies in the arts, humanities and social sciences. The Trinity Indian Society was launched in 2009 by the Provost of Trinity College Dublin and the Indian Ambassador to Ireland, His Excellency, P.S. Raghavan. 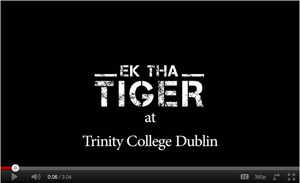 Its aim is to provide a ‘home away from home’ for Indian students studying in Trinity College. The University is building on its links with India as part of globally networked cooperation in education and science. It is also strengthening Irish-Indian innovation through research and business opportunities. A number of high-profile cooperation projects already exist in the sciences with top Indian institutions such as the National Centre for Biological Sciences (NCBS) in Bangalore. The University of Dublin, Trinity College, founded the South Asia Initiative two years ago, which brings together teaching and research across a range of disciplines in the humanities and social sciences and gives fresh impetus to engagement with India in particular. It also seeks to raise awareness of Indian history, culture and society within Ireland and for this purpose has developed strong ties with the Indian community in Ireland. A newly appointed post in Indian history and culture is supported by over 20 Indian organisations. The Indian Council for Cultural Relations is also sponsoring visiting Professorships at Trinity College Dublin.